DELIVERING quick ramp-up and cool-down, Cole-Parmer’s Polystat lab chillers are available in two power ratings (250 or 500 Watts) and in a choice of force or force/suction pump models. The 500 watt model can cool a 2.8 litre reservoir from ambient to -10C in under 17 minutes. Polystat closed circulators are suitable for cooling or heating analytical instrumentation, jacketed reactors, or rotary evaporators. They can also be used as an economical chiller to replace tap water cooling in small laboratory applications. Built-in energy-saving makes these chillers an environmentally-sensible choice for any laboratory, says Cole-Parmer. The energy saving control enables the chillers to operate at minimum power but does not increase the cooling time, delivering significant savings in running costs. With a USB port and digital controller with five set temperatures, these devices are easy to operate. The air-cooled refrigeration system means there is no need for an external water source, and the small internal reservoir limits evaporation. 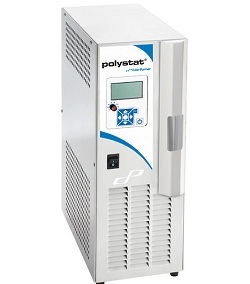 Polystat lab coolers are also quiet in operation, says the company, producing less than 58dBA. ← The ultimate scientist’s business card?